Early in December, astronomers confirmed the existence of the first known world beyond the Solar System that exists in a cozy, habitable zone around its sun-like star. It’s too soon to say whether the planet, called Kepler-22b, has a rocky, watery or gassy surface. Nevertheless, NASA used some artistic license to render the planet (below), casting it in a green-blue with wispy white clouds. Astrobiologist Abel Mendez of the University of Puerto Rico at Arecibo, who is developing new software to render scientifically accurate images of exoplanets, said NASA’s illustration misses the mark. To Mendez, it’s more than an artistic quibble. Since the Kepler telescope launched in March 2009, the space-based observatory has pinpointed a whopping 2,326 exoplanet candidates, and that number is growing by about 70 planets a month. It’s an untenable situation for space artists, whose renderings often lack the accuracy informed by current planet formation theories. More importantly, said Mendez, databases of scientifically informed portrayals of unseen exoplanets — including animations — could help make sense of direct future observations. If these portrayals are shrunk to tiny points of light — resembling some of the direct exoplanet images obtained by astronomers so far — the pictures could hint at the planets' conditions. Mendez plans to develop those features in his open source exoplanet-creating program, codenamed the Scientific Exoplanets Renderer. 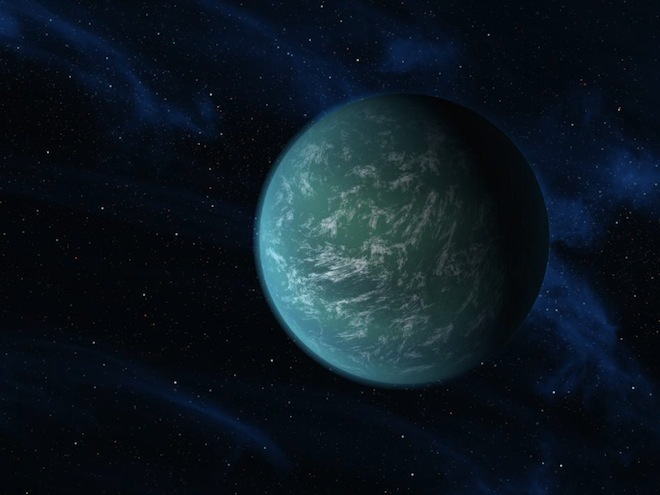 Although he hasn't yet imaged Kepler-22b, he has rendered 16 of 48 other potentially habitable exoplanet candidates discovered by the Kepler space telescope. Astronomers need only a few pieces of information to use the software, such as the distance an exoplanet orbits from its star, the temperature and radius of the star and the exoplanet’s radius or mass. The software then uses leading planet formation theories to produce detailed renderings of the distant world. The software can tackle everything from scorching-hot gas giants larger than Jupiter to rocky worlds smaller than Earth and render color-accurate atmospheres, oceans, lakes and land masses. It can even cut animated videos of rotating planets if given ample computer processing time. Wired.com offered to take the program for a spin, but Mendez said it’s an alpha release that’s not ready for public eyes — even most astronomers won’t get to try until March or April of 2012. When Mendez’ team of about 10 people release the program, however, he said they’ll start working on a more streamlined version that anyone can use. “Perhaps even Hollywood,” Mendez said. On the following pages, Wired looks at the Scientific Exoplanet Renderer's planetary visions.